Blow molded cases offer the very best in state-of-the-art case design and technology. Blow molded casing creates a seamless, highly durable shell that protects your military or other sensitive equipment as no other case manufacturing process can. A diagram at the bottom of this page shows more information on this process. Ameripack’s line of Blow Molded Cases includes a variety of types such as BMP Series Carrying Cases, Blow Molded Infinity Cases and others. 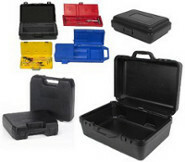 Ameripack BMP Carrying Cases: Stock, Semi-Custom, Custom – You Name It, We Have a Product for You! 180° opening for easy accessibility. No other manufacturer compares to Ameripack. 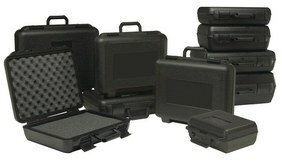 These Ameripack Blow Molded Infinity Cases provide you with value, image, protection and presentation options. Double wall construction allows exact product fit and protection. The INFINITY Case combines an eminently professional look with performance to match! Why are blow molded cases superior? 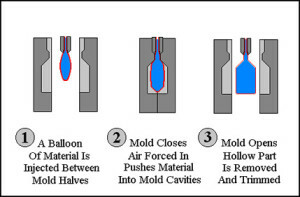 Blow molded cases are formed by blowing plastic into a metal mold. This process creates a case that is uniquely and uniformly durable by virtue of its seamlessness and the use of thermoplastics. For more information on this process, please see the diagram at the bottom of this page. Thermoplastics are state-of-the-art polymers renowned for being long lasting. Lego is one manufacturer that has built their reputation on the use of thermoplastics. And Ameripack is another one. Mass produced glass products are also created using blow molding. Resistance to many toxins, chemicals, etc. To further protect your gear, Ameripack specializes in custom foam inserts that can be fitted or cut to match your product’s requirements down to the detail.